Are you planning a fall wedding? Then its time to start thinking about Fall wedding bouquets. Your wedding flowers are very important, and none more so than the bouquets you and your bridesmaids are going to carry. You may be wondering which flowers to choose, or how much you can expect to pay. Every bride has questions about the flowers for her big day, and here you'll find answers to many frequently asked questions about fall wedding bouquets. and for fall brides, a very important fourth consideration is Availability since certain flowers will be harder to find in the late part of fall. Most questions about your wedding flowers are closely related to on of these primary issues and knowing a little bit in advance will help prepare you for a trip to the florist or flower mart. You will also get a few ideas for jazzing up a plain bouquet. Let's get started! How Much Should I spend on Flowers? The top designers are highly sought after and therefore can afford to charge more for their services. If you have your heart set on a particular floral designer or exotic flowers like orchids you can of course expect to pay a premium. 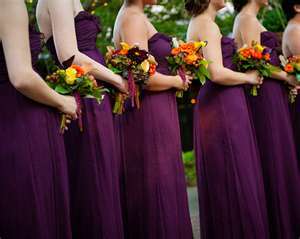 However if you are like most brides you are looking to spend a fairly modest amount on your fall wedding bouquets. If you are planning on having lots of bridesmaids or other attendants you'll need to consider how much this will add to the cost of your floral budget. Many florists will offer a discount for larger orders, so don't be afraid to ask, and there are many other ways to save money on gorgeous bouquets. Bare bones type arrangements for the bride will run about fifty to seventy dollars, with more elaborate bridal bouquets starting at around one-hundred fifty dollars and up so start with this in mind. Fall weddings are beautiful. The weather is just starting to turn chilly and leaves begin to change from green to gold and brown. The good news is that the staple flowers brides often desire for their fall wedding bouquets are available all year long. Tying in special add-ins for the fall season can turn an ordinary bouquet into something extraordinary and will tie the theme in beautifully. Here are a few ways to make your fall bouquets stand out. How can I make my Bouquet Stand out? • Use Natural materials -Fall foliage yields beautiful natural accents for bridal flower bouquets. In autumn, rich, deep shades of flowers are paired with decorative fillers like curly willow, and even vegetables, such as artichokes. Fall leaves also make an always appropriate addition to your bouquet or other wedding flowers. • Use unexpected color -Chocolate-brown has long been the go-to color for fall, but the trend lately is shades of gray. Silvery foliage is paired with tones like deep crimson for a sophisticated fall look. If you feel especially daring you can even use tones of grey and brown together, if balanced just right these make a wonderful and unique color scheme for your fall wedding. • Try something trendy, like feathers -Feathers, no matter the type are the hot new texture to add, and brides are putting them to great use in fabulous fall wedding bouquets. They contribute color and shine you just can't get in a flower, and they add glamour and sophistication to your bouquet as well. Fall lends itself especially well to this particular trend, and there are some great options to choose from that will really help capture the essence of fall. Peacock feathers are one very popular choice, as are ostrich feathers, but for a fall wedding my personal favorite are gorgeous striped pheasant plumes. 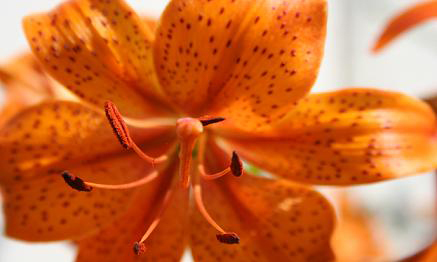 They look striking against a background of oranges, reds or creamy yellow shades. • Make It Sparkle -You can also add a bit of glamour to your fall wedding bouquets by using a fancy or ornate trim for the bouquet handle. The wrap can be folksy, fun or fancy, depending on your taste, and you don't have to be a professional to pull together just the right look. A great way to save a little money, and still get a terrific bouquet is to have a professional florist create your bouquet, and then wrap your bouquet stem yourself. Designers often charge a huge premium for the simplest embellishments, so if your feel up to it, and you can find the right ribbon or trim, why not get a little more bang out of your already fabulous bouquet? Which Flowers for a Fall Wedding Bouquet? 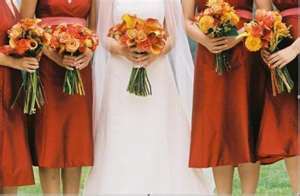 For fall wedding bouquets, the type of flowers you use can be a major concern. You may worry that the flowers you wish to use aren't going to be available during that time of year, or will be tremendously expensive. Not to worry, most flowers are available year round, and the most popular choices can be found easily. For fall weddings the best flowers are roses or calla lilies. Roses are an obvious choice because they are beautiful, hardy and available in the best of fall colors. Calla lilies are equally beautiful, and make a great choice for fall themed weddings, because they come in an absolutely amazing shade of pumpkin orange and an equally vibrant, deep yellow. You may find other great flowers to use for fall, but roses and callas are a great place to start. I hope you've gotten a few good ideas for fall wedding bouquets,check back soon for a gallery of gorgeous new ideas for this theme.